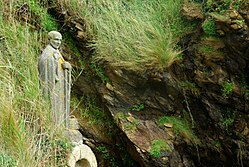 Statue of Saint Gildas near the village of Saint-Gildas-de-Rhuys (France). Glastonbury Abbey, now destroyed, or Rhuys Church, extant. Gildas (Breton: Gweltaz; c. 500 – c. 570)[a][b] — also known as Gildas the Wise or Gildas Sapiens — was a 6th-century British monk best known for his scathing religious polemic De Excidio et Conquestu Britanniae, which recounts the history of the Britons before and during the coming of the Saxons. He is one of the best-documented figures of the Christian church in the British Isles during the sub-Roman period, and was renowned for his Biblical knowledge and literary style. In his later life, he emigrated to Brittany where he founded a monastery known as St. Gildas de Rhuys. Differing versions of the Life of Saint Gildas exist, but both agree that he was born in what is now Scotland on the banks of the River Clyde, and that he was the son of a royal family. These works were written in the eleventh and twelfth centuries and are regarded by scholars as unhistorical. He is now thought to have his origins further south. In his own work, he claims to have been born the same year as the Battle of Mount Badon. He was educated at a monastic centre, possibly Cor Tewdws under St. Illtud, where he chose to forsake his royal heritage and embrace monasticism. He became a renowned teacher, converting many to Christianity and founding numerous churches and monasteries throughout Britain and Ireland. He is thought to have made a pilgrimage to Rome before emigrating to Brittany, where he took on the life of a hermit. However, his life of solitude was short-lived, and pupils soon sought him out and begged him to teach them. He eventually founded a monastery for these students at Rhuys, where he wrote De Excidio Britanniae, criticising British rulers and exhorting them to put off their sins and embrace true Christian faith. He is thought to have died at Rhuys, and was buried there. After completing his studies under St. Illtud, Gildas went to Ireland where he was ordained as a priest. He returned to his native lands in northern Britain where he acted as a missionary, preaching to the pagan people and converting many of them to Christianity. He was then asked by Ainmericus, high king of Ireland (Ainmuire mac Sétnai, 566–569), to restore order to the church in Ireland, which had altogether lost the Christian faith. Gildas obeyed the king's summons and travelled all over the island, converting the inhabitants, building churches, and establishing monasteries. He then travelled to Rome and Ravenna where he performed many miracles, including slaying a dragon while in Rome. Intending to return to Britain, he instead settled on the Isle of Houat off Brittany where he led a solitary, austere life. At around this time, he also preached to Nonnita, the mother of Saint David, while she was pregnant with the saint. The second "Life" of St. Gildas was written by Caradoc of Llancarfan, a friend of Geoffrey of Monmouth and his Norman patrons. However, Llancarfan's work is most probably historically inaccurate, as his hagiographies tend towards the fictitious, rather than the strictly historical. Llancarfan's "Life" was written in the 12th century, and includes many elements of what have come to be known as mythical pseudo-histories, involving King Arthur, Guinevere, and Glastonbury Abbey, leading to the general opinion that this "life" is less historically accurate than the earlier version. For example, according to the dates in the Annales Cambriae, Gildas would have been a contemporary of King Arthur: however, Gildas' work never mentions Arthur by name, even though he gives a history of the Britons, and states that he was born in the same year as the Battle of Badon Hill, in which Arthur is supposed to have vanquished the Saxons. In the Llancarfan Life, St. Gildas was the son of Nau, king of Scotia. Nau had 24 sons, all victorious warriors. Gildas studied literature as a youth, before leaving his homeland for Gaul, where he studied for seven years. When he returned, he brought back an extensive library with him, and was sought after as a master teacher. He became the most renowned teacher in all of the three kingdoms of Britain. Gildas was a subject of the mythical King Arthur, whom he loved and desired to obey. However, his 23 brothers were always rising up against their rightful king, and his eldest brother, Hueil, would submit to no rightful high king, not even Arthur. Hueil would often swoop down from Scotland to fight battles and carry off spoils, and during one of these raids, Hueil was pursued and killed by King Arthur. When news of his brother's murder reached Gildas in Ireland, he was greatly grieved, but was able to forgive Arthur, and pray for the salvation of his soul. Gildas then travelled to Britain, where he met Arthur face to face, and kissed him as he prayed for forgiveness, and Arthur accepted penance for murdering Gildas' brother. After this, Gildas taught at the school of St. Cadoc, before retiring to a secret island for seven years. Pirates from the Orkney Islands came and sacked his island, carrying off goods and his friends as slaves. In distress, he left the island, and came to Glastonbury, then ruled by Melvas, King of the 'Summer Country' (Gwlad yr Haf, Somerset). Gildas intervened between King Arthur and Melvas, who had abducted and raped Arthur's wife Guinevere and brought her to his stronghold at Glastonbury. Arthur soon arrived to besiege him, but, the peacemaking saint persuaded Melvas to release Guinevere and the two kings made peace. Then desiring to live a hermit's life, Gildas built a hermitage devoted to the Trinity on the banks of the river at Glastonbury. He died, and was buried at Glastonbury Abbey, in the floor of St. Mary's Church. The Llancarfan Life contains the earliest surviving appearance of the abduction of Guinevere episode, common in later Arthurian literature. Huail's enmity with Arthur was also apparently a popular subject in medieval Britain: he is mentioned as an enemy of Arthur's in the Welsh prose tale Culhwch and Olwen, written around 1100. A strongly held tradition in North Wales places the beheading of Gildas' brother Huail at Ruthin, where what is believed to be the execution stone has been preserved in the town square. Another brother of Gildas, Celyn ap Caw, was based in the north-east corner of Anglesey. The work is a sermon in three parts condemning the acts of his contemporaries, both secular and religious. The first part consists of Gildas' explanation for his work and a brief narrative of Roman Britain from its conquest under the Principate to Gildas' time. He describes the doings of the Romans and the Groans of the Britons, in which the Britons make one last request for military aid from the departed Roman military. He excoriates his fellow Britons for their sins, while at the same time lauding heroes such as Ambrosius Aurelianus, whom he is the first to describe as a leader of the resistance to the Saxons. He mentions the victory at the Battle of Mons Badonicus, a feat attributed to King Arthur in later texts, though Gildas is unclear as to who led the battle. De Excidio is usually dated to the 540s, but the historian Guy Halsall inclines to an "early Gildas" c. 490. Cambridge historian Karen George offers a date range of c. 510–530 AD. Gildas' relics were venerated in the abbey which he founded in Rhuys, until the 10th century, when they were removed to Berry. In the 18th century, they were said to be moved to the cathedral at Vannes and then hidden during the French Revolution. The various relics survived the revolution and have all since been returned to Saint-Gildas-de-Rhuys where they are visible at various times of the year at a dedicated "treasury" in the village. The body of Saint Gildas (minus the pieces incorporated into various reliquaries) is buried behind the altar in the church of Saint Gildas de Rhuys. ^ The composition of De excidio has been dated to between 479 and 484 by Nick Higham, and between 515 and 530 by Thomas D. Sullivan. This gives a birth date for Gildas around the middle of the fifth century. However, David Dumville places it later at c. 500. ^ The date of Gildas death is taken from the Annales Cambriae, this is regarded by François Kerlouégan "as, at best, traditional". ^ a b Kerlouégan. Gildas in Oxford Dictionary of National Biography. ^ Kerlouégan, "Gildas"; Williams, "Gildas"
^ Williams, Hugh. "The Life of Gildas by the Monk of Ruys". Two Lives of Gildas by a monk of Ruys and Caradoc of Llancarfan. Retrieved 18 February 2014. ^ Williams, Hugh. "The Life of Gildas by Caradoc of Llancarfan ca. 1130–1150". Two Lives of Gildas by a monk of Ruys and Caradoc of Llancarfan. Retrieved 18 February 2014. ^ Thomas of Monmouth; Rubin, Miri (2014). The Life and Passion of William of Norwich. New York: Penguin Classics. pp. xii. ^ Halsall, Guy (2013). Worlds of Arthur: Facts & Fictions of the Dark Ages. Oxford, UK: Oxford University Press. p. 54. ISBN 978-0-19-870084-5. ^ George, Karen, Gildas's De excidio Britonum and the early British church, Studies in Celtic History 26, Boydell Press, 2009, p. 125. ^ a b c d e "Pourmenadenn-e-ruiz - Promenade a Rhuys - Saint-Gildas-de-Rhuys - l'Eglise - le Trésor". Dumville, David N. (1984). "The Chronology of De Excidio Britanniae, Book 1". In Dumville, David; Lapidge, Michael (eds.). Gildas: New Approaches. Martlesham: Boydell Press. ISBN 978-0-85115-403-9. Higham, N. J. (1994). English Conquest: Gildas and Britain in the fifth century. Manchester: Manchester United Press. ISBN 978-0-7190-4080-1. Sullivan, Thomas D. (1978). De excidio of Gildas: its authenticity and date. New York: Brill. ISBN 978-90-04-05793-7. Williams, Ann (1991). "Gildas author fl. mid-sixth century". In Williams, Ann; Smyth, Alfred P.; Kirby, D. P. (eds.). A Biographical Dictionary of Dark Age Britain. Seaby. ISBN 978-1-85264-047-7. Wikimedia Commons has media related to Saint Gildas. The Life of Gildas by A Monk of Rhuys. The Life of Gildas by Caradoc of Llancarfan. Gildas and The History of the Britons commentary from The Cambridge History of English and American Literature, Volume 1, 1907–21. Chisholm, Hugh, ed. (1911). "Gildas" . Encyclopædia Britannica (11th ed.). Cambridge University Press.